Health Hints is an interactive game that can be used with an entire classroom. Students will have fun while learning about many different health careers and medical terminology. Two teams compete with team members taking turns giving clues to make his/her team members guess the Health Hints word without using the five clues listed on the card. Each team tries to complete as many word cards as they can in 60 seconds. The cards are color-coded for levels of difficulty. Each level of play strengthens the students’ knowledge of health careers and builds confidence and communication skills. Suitable for grades 6-12. 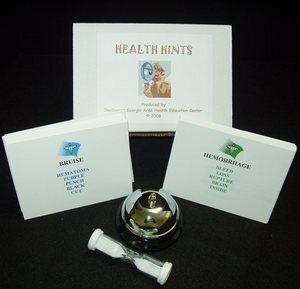 Game includes 140 two-sided cards, timer, instructions, and game bell.